Naval power has always played a critical role in the way great powers interact. The decades leading up to the outbreak of the First World War saw an unprecedented competition between the UK and German Empire, with much of the emphasis placed on Dreadnought battleships echoing a similar, albeit smaller, naval arms race gathering steam between the US and China. At the beginning of the 20th century, the British Royal Navy was unrivalled in its ability to rule the waves. Maintaining this capability was the 'two-power' standard, which sought to ensure that the Royal Navy was at least the size of the next two largest competing navies. This naval might guaranteed the British economy's access to vital raw resources and helped ensure that the "sun never set on the British Empire". In the distance, as France struggled to rebuild itself as a true competitor, the newly formed German Empire emerged as an economic, political and naval competitor to Britain. Driven by voracious consumer and economic demand, combined with a new sense of national purpose, Bismarck's Germany rapidly became a European and global powerhouse in the decades following its formation in 1871. Recognising the mounting challenge, the British Royal Navy launched HMS Dreadnought in 1906, effectively resetting the game and laying down the challenge to Germany and any other nation that sought to challenge the industrial, economic and naval might of the British Empire. Fast forward to the the beginning of the 21st century and the US, following decades of the Cold War, remained the world's largest and most powerful naval power. Commanding the seas through a vast fleet of technologically advanced surface vessels and submarines, with the mighty supercarrier serving as the epicentre of America's global maritime hegemony. 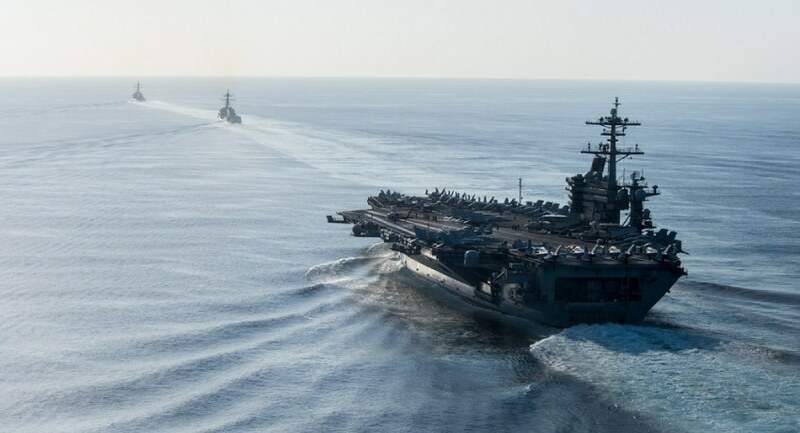 However, America's maritime hegemony is now being challenged by a rising power in China that is introducing a suite of maritime capabilities to rival the dominance of the US Navy, as history appears to be repeating itself in the 21st century. The Anglo-German naval race was characterised by the pursuit of ever more powerful and complex battleships and, later, battlecruisers, then the pinnacle of naval power projection and national prestige. Dreadnought set the stage for the naval competition that would come to dominate the relationship between the Germany and Britain. Successive appropriation bills championed by both British and German naval planners sought to keep the two nations in constant competition with one another. Between the completion of Dreadnought in 1906 and the outbreak of war in 1914, the Royal Navy successfully employed a fleet of 29 dreadnought battleships and nine battlecruisers, compared with Germany's fleet of 17 dreadnought-battleships and seven battlecruisers. This period of unprecedented naval build-up stretched the economic, financial and industrial capabilities of both competitors, often at the cost of the nations' other branches of the armed forces. Both the US and China continue to invest heavily in the potent power projection capabilities provided by aircraft carriers and large-deck amphibious warfare ships. While the US enjoys a substantial quantitative and qualitative lead over the Chinese People's Liberation Army - Navy (PLA-N), with a fleet of 11 nuclear powered supercarriers and two currently under construction, China's strategic planners know that they don't need to exercise global maritime hegemony in the way the US does. USS Ronald Reagan (CVN-76) – Yokosuka, Japan – currently on operations in the Philippine Sea. Both the Nimitz and Gerald R Ford Class supercarriers are exceptionally potent power projection platforms, weighing in at 100,000 tonnes, supporting 85-90 fixed-wing and rotary-wing aircraft, including F/A-18 E/F and G series Super Hornets and Growlers, MH-60S/R Seahawk helicopters, E-2D Advanced Hawkeye airborne early warning aircraft and growing numbers of the fifth-generation F-35 'C' carrier-based variant of the F-35 Lightning II Joint Strike Fighter. The PLA-N has focused its attention on building an aircraft carrier force focused on establishing and maintaining control of the vital sea-lines-of-communication in the Indian and Pacific Oceans, while also leveraging the powerful defensive anti-access/area denial networks provided by the vast network of reclaimed islands in the South China Sea. The Chinese have successfully put to sea two aircraft carriers. The Liaoning (CV-16), the first Chinese carrier (Type 001), was commissioned in 2012 and provides a potent, 58,600 tonne, 304.5-metre platform capable of supporting an airwing of 40 fixed and rotary-wing aircraft, including the Shenyang J-15, a Chinese variant of the Russian designed Su-33 Flanker D and a fleet of domestic support helicopters. CV-17, the second Chinese carrier, was commissioned earlier this year as an enlarged variant of the Liaoning and is a 70,000-tonne, 315-metre vessel with a similar airwing capacity of 40 fixed and rotary-wing aircraft. China has plans to see an expanded carrier force incorporating a large fleet of up to four nuclear-powered supercarriers expected to be similar in size and capability to the US Nimitiz and Ford Class carriers, supporting an airwing of between 70 and 100 fixed and rotary-wing aircraft that would serve as the mainstay of the Chinese naval force, focused on Chinese power projection and resource security. While the naval race, driven by the pursuit of ever more powerful aircraft carrier platforms, is the most visible example of the ensuing arms race between the two global powers, China and America are currently in competition with one another, racing to develop a number of next generation platforms and technologies seeking to tip the tactical and strategic balance of power in their favour. As part of this series we will take a closer look at key battlegrounds in the 21st century's arms race, including the development of fifth-generation combat aircraft like the F-35 Joint Strike Fighter and J-20, advanced nuclear powered attack and ballistic missile submarines like the Columbia and Type 096, and the Virginia and Type 093 submarines. Finally, we will also take a closer look at the development and introduction of new long-range strike platforms, including the B-21 Raider and China's rumoured H-8 stealth strategic bomber, and long-range missile systems including the growing US arsenal of stand-off weaponry designed to counter A2AD networks and the Chinese DF-21 and broader Dong Feng series of ballistic missiles.